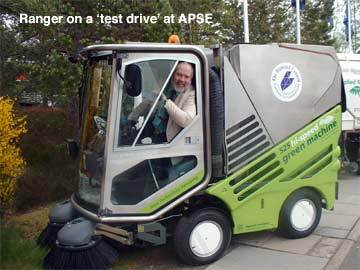 While at the APSE conference in Aviemore, I took the opportunity to inquire about what the Council members look for in a sweeper. It was a completely anecdotal survey, developed solely from the people I was able to talk to who were involved in the sweeper purchasing process. Prior to revealing the results of my survey, it makes sense to discuss the differences in the U.K. sweeping requirements. For one, the U.K. has a torturous tendering process, which often takes 6-8 months to produce a purchase. That's significantly longer than typically required in the U.S. Also, there seems to be no parallel process to the 'piggybacking' that is often made available in America. This is where other purchasers are able to find a way to purchase a sweeper as a result of a bid process carried out by a nearby municipality, or when one or more machines are made available, at a particular price, throughout a state. Also rare in the U.K. is that, in many cases, the tender for sweepers is actually carried out and won by a chassis supplier. The sweeper manufacturer then receives the order from the chassis dealer. The sweeper that is purchased might be whatever was low bid or, in rarer cases, could have been specified in the bid. This process completely changes the dynamics of the purchase. There are also companies in the U.K. that specialize in providing sweepers at a particular price per contract period. This can range from as little as a week to as long as a requirement might specify. In contrast to getting rental or leased sweepers in the U.S., these companies provide the machines with complete maintenance contracts. If a sweeper breaks, a 'hire company' might be required to provide a service call within as little as 4 hours, and have it fixed within 24 in order to sidestep any penalties. In the U.K., the law requires than an operator is able to see the hopper door while it's closing. This determines the design of all sweepers. Also, because the curb height in U.K. is as little as 4", the gutter broom configuration is substantially different from the U.S. Additionally, sweepers in the U.K. seldom have dual controls. Rather, most are outfitted with a left-hand-only drive (Remember that, here, cars travel on the left side of the road). Finally, most all sweepers have historically been outfitted with a manual transmission, on the theory that they are less costly to fix. However, that particular philosophy id beginning to change. Okay. Here's what I learned about the most important factors of sweeper purchasing. I found it interesting that, given the limited choice available in the U.K., 'brand recognition' seemed to top the list. Everyone's top 3 included having previous knowledge and experience with the sweeper company that built and backs the machine. This factor will no doubt make it a little tougher go for the Schwarze organization as they enter into the U.K. sweeper marketplace. In second place, slightly ahead of the perennial favorite, price, was a concern for getting a top notch level of spare parts and service support on whatever sweeper is being purchased. Although not a large geographical area, it is often a long distance between major cities in both Scotland and the U.K. After traveling throughout much of Scotland in order to get to Aviemore and back, I could well understand this concern. Maneuverability was cited at about the same frequency as sweeping proficiency/productivity and operating cost. The streets are narrower, on average, than they are in the states. Also, from what I observed, parking can be even more of a problem than it is in the U.S. That is to say, it's more difficult to require cars to be moved, since there are no other places to put them on sweeping days. No doubt that's why there is an entire class of smaller sweepers here that we don't see much of in America. Payload was cited as a concern, but this varied from place to place, depending on how far it was to their particular dumpsite. This dovetails, I thought, with what we see in the U.S. Some want larger machines that can carry more debris, others would rather have a lower operating cost and drive to the 'tip' more often. Ditto for the preference for either high or low dumping machines. Several gentlemen I spoke to wanted a choice of chassis, so they'd have an opportunity to match the sweeper's chassis with other trucks already in their fleet. Availability of the preferred chassis was also discussed, since it can often take a long time to receive delivery of a particular chassis. That's probably why, in many instances, the tendering process has evolved to position the chassis dealers as the lead agency. The above point ties into another area of concern-delivery times to get a new unit. One gentleman told me that although, occasionally, the need for a new sweeper can be predicted far enough in advance and the money procured from budget, at other times a new sweeper is needed right away in the event of accidents or catastrophic failure. Finally, there were several people who simply did not want a hydrostatic transmission. They were quite clear that they would not buy one, however, their reason surprised me. They insisted that the resale value of a hydrostatic was inevitably less than with a standard transmission. I believe this is probably true for sweepers that come off lease and need the body removed so they can be re-sold as a chassis. I'm less sure that it would be a factor if the sweeper is re-sold for additional use in the same capacity. So, there you have it. No science involved. However, I did speak to a quite a number of people about these issues and, as those who participated read this, thank you very much for your input! Perhaps this article may be of assistance to you in your future purchasing decisions. As for our American and other readers, the intent of my survey was also to give you a basic idea of the sweeper market here in the U.K. I'll leave it to you to decipher the differences and similarities between the U.K. marketplace and that of your own locale. Now let's look at Scotland's National Waste Strategy.